2. Heat oil and butter in a large pan, add mushrooms and stir-fry until golden brown and moisture has evaporated. 3. Meanwhile toast ciabatta. Spread ricotta cheese over ciabatta. 4. Stir parsley and balsamic vinegar into mushrooms. 5. 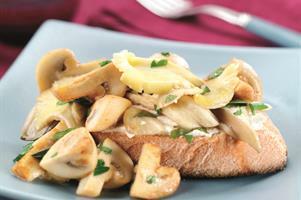 Place a piece of ciabatta on each plate and top with mushrooms.